Cedar Wood Resort is a family friendly 12-unit resort located just 1/2 mile off 13 Highway in Kimberling City, quietly nestled in the back of Fisher Creek cove. We are only minutes from a wide variety of retail stores, including groceries, restaurants, and gas stations. Your family will be welcomed to enjoy our crystal clear pool with jetted seats, huge paviliion w/ gas grill, dock w/ swim & fish platform, mini-golf, basketball area, campfire, and huge playground. All our cabins have kitchenettes, dvd players, flatscreen TV's, covered porches with rocking chairs and many more things to make you feel right at home. 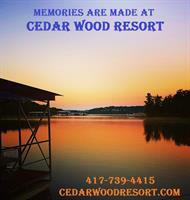 Memories are made at Cedar Wood Resort! My wife and I want to thank you for your interest in our wonderful resort. One visit with us and you'll see WE LOVE WHAT WE DO! 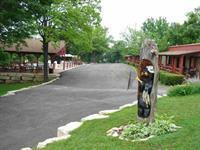 We will do everything we can to make your stay with us at Cedar Wood Resort as enjoyable as possible. To all of our past & future customers: Thank You ! We Love what we do ! We welcome you to check us out on TripAdvisor. We are proud to say we are a 2015 Certificate of Excellence award winner! Come enjoy our many great amenities!